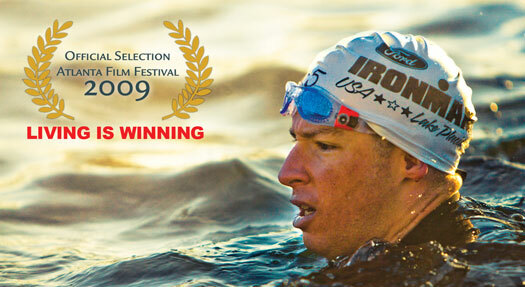 On Monday night I attended the premiere of the documentary “Living is Winning” at the 2009 Atlanta Film Festival, where a packed house followed the story of professional IronMan competitor Drew Johnston, an athlete who refused to allow Leukemia to stop his desire to win the grueling IronMan World Championship competition in Hawaii. I hadn’t been feeling very good lately and had almost decided to go home instead, but then I thought about how much time and effort my friend Linda Burns had put into producing and directing this film, and how hard Drew Johnston had fought to stay alive. Ordering the ticket took 3 minutes, and I’m so glad that I made the effort to see the movie, even if I didn’t have the energy to stay to mingle with people afterward.